This drama follows a young boy and a young girl as they plan to launch a music group shortly after being released from prison. 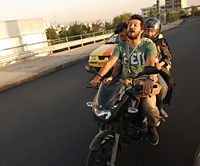 Both characters travel to Teheran where they meet other underground rock musicians and attempt to convince them to leave Iran. However, their dreams to flee to Europe in order to play music freely seem improbable without money or a passport. No One Knows About Persian Cats premiered at the Cannes Festival 2009; it was the opening film of the Un Certain Regard selection and won the Special Jury Prize.